Fineartstore.com offers an incredible selection of high quality charcoal imported from Sennelier in France, Coates in England, Nitram in Canada and Holbein in Japan. We are also proud to offer US produced charcoals from General Pencil and Grumbacher. 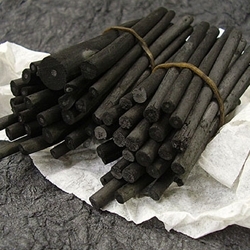 You will find thin vine charcoals, nice thick willows, big round sticks to huge square batons. We also offer excellent quality charcoal pencils, compressed charcoals, and even water soluble tinted charcoals from Derwent. Don’t forget our nice selection of newsprint and textured drawing papers to compliment these wonderful charcoals.